I’ve been slowly going through each room of my house and doing a little Spring cleaning. Chuy might be small but he’s a big part of our house! Not only that, I seem to find socks, dog toys, and dog hair all over my home! As much as I love Chuy, I don’t love the mess that comes with owning a pet! I’ve put together ten Spring Cleaning tips for pet parents. Go through your pet’s pantry and dispose of any expired or stale pet food/treats. Make sure all bags and containers are clean and air tight. If you want to save space and make your storage look better, check out our DIY Pet Treat Jars. If you have treats or food you are no longer using but are not expired, donate them to your local animal shelter! Keep any toys that your pet still plays with and are still in good condition . . . or maybe they still just play with. Chuy has this thing that used to be a stuffed monkey and I find it ALL over the house! He takes it everywhere and I have no clue why! Donate toys your pet doesn’t play with but are in decent condition to your local animal shelter. Broken and damaged toys should go in the trash as they can pose a danger to your pet. Do you have grooming products that are expired? Toss them! Clean all brushes, combs, etc. Be sure to check out our DIY Grooming Kit for tips on how to organize your pet’s grooming supplies. Chuy has two different beds, one in my office and another in the living room. I periodically clean them throughout the year but Spring is the perfect time to REALLY give them a good wash! I also plan on replacing some of the filling from one of the beds. If it’s time to make your pet a vet appointment, get it on the calendar now! I keep all of Chuy’s medical records in a binder that I store in my home office. That way I can quickly grab it in case of an emergency or just in case the vet needs any info during a routine appointment. Also, make sure phone numbers, addresses, and contact info is correct on all your pet’s records including their microchip and tag. Another tip is to create an emergency contact sheet for your pet. If you don’t have a pet first-aid kit, now is the time to create one! If you do have one, take a few minutes to verify expiration dates on medications and refill any products you’ve used. Pet bowls should be cleaned after every feeding to ensure you’re not passing bacteria and germs to your pet. Take some time to scrub out bowls and give them a good cleaning! This is the perfect time to replace the air filters in your home. Look for specialized air filters for pet owners that work extra hard to minimize dust and danger allergens. Pet collars, harnesses, and leashes are not intended to last forever! Normal wear and tear will cause them to lose their effectiveness. Take this time to make sure your pet’s collar and harness still fit and are in good working order. Also, make sure your leash is still working. As a pet owner, regular cleaning and vacuuming is a must! Spring cleaning is the perfect time to give your floors a deep cleaning. Paws track in lots of mud and dirt! Deep cleaning your carpets also gets rid of pet hair and urine. 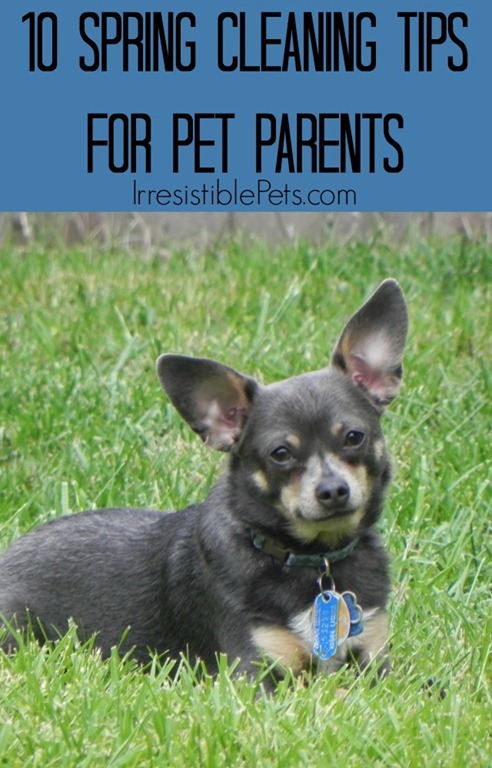 I love my Bissell Carpet Cleaner and recommend it for any pet parent! What tips do you have for Spring Cleaning? Leave them below in the comments! I recently got this tip from my sister. You’ve shampooed the carpet but still have that urine smell? If you can pull back carpet, paint the plywood or cement where the pet stain is with Kilz. It’s a sealer for under paint. This will seal the stain and the odor. I love that! We are definitely going to try this when we get back from BlogPaws! We really need to sort through all of our doggy stuff!! !